The real stars of the "Let's Talk!" dinner, Honors Program ambassadors, from left, Emily Miller, Julie Matteson, Abbi Konowitz, and Heather Liner. The silverware is barely dry after this year's "Let's Talk!" dinner, but planners say the event was so successful that they have already set the date for next year. The event raised $55,600 for scholarships for students in the Elliott T. Bowers Honors Program and operating expenses for the program, with more than 230 alumni, friends and community leaders gathering for good food and stimulating discussion in the LSC Ballroom at Sam Houston State University. In addition to Sam Houston State University's growing enrollment, more students with higher levels of potential academic achievement are coming to SHSU, said event organizers. This means more need for Honors scholarships. "'Let's Talk!' 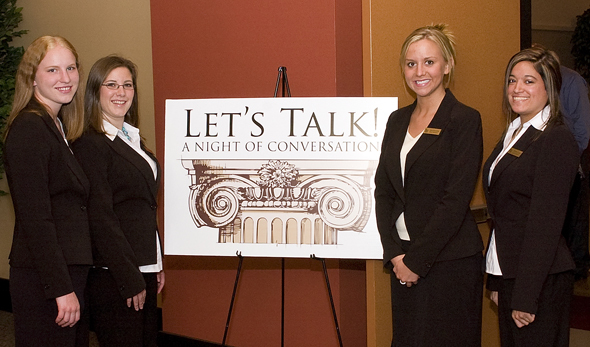 is designed to help revive the vanishing art of conversation," said Nancy Gaertner, who chaired the event. "We hope it will become one of the most anticipated fundraisers in Huntsville." Next year's "Let's Talk!" will take place March 26, 2009 in the LSC Ballroom. During the first "Let's Talk!" on March 27 there was a cocktail hour followed by a seated dinner and no program other than lots of lively conversation, followed by dessert and coffee. More than 23 interesting and accomplished persons served as discussion leaders at tables of 10. Marcus Luttrell, former Navy seal and former SHSU student who wrote a book about his daring rescue in Afghanistan, received a standing ovation when he was introduced. Other topics included forensic science, the economy, challenges in higher education, Saddam Hussein's regime, as well as art, music, sports and more. In addition to the $100 per person ticket price, sponsorships were sold at levels of $25,000, $5,000, and $2,500. The Sam Houston Foundation was the sole platinum ($25,000) sponsor. Silver ($5,000) sponsors included Robert and Erin Steele, Bennie and Martee Rush and Jack and Kathleen Staggs. Bronze ($2,500) sponsors included the John G. and Marie Stella Kenedy Memorial Foundation, Inc., Huntsville Memorial Hospital, Ron and Donna Koska, Jack Heard, Jr. and Mac Woodward, Howard and Diane Payne, Texas State University System regent Trisha S. Pollard, and Dan and Eloise Leonard.